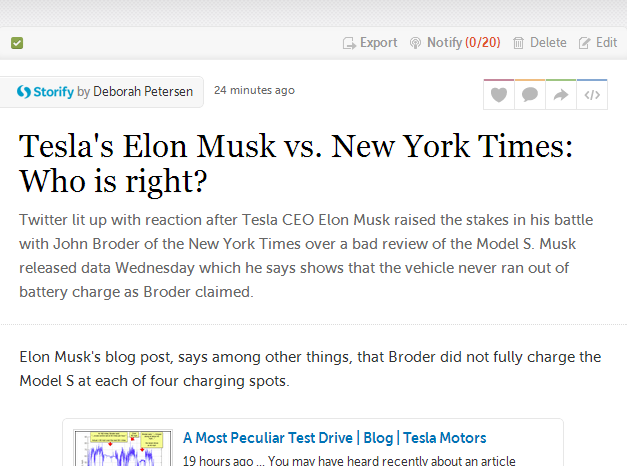 As I am sure you have heard by now, Elon Musk wrote a detailed blog post Wednesday night in which he says the Model S never ran completely out of battery charge when writer John Broder test drove it. Broder said in his New York Times review of the drive that it did run out of battery charge and he had the Tesla loaded on to a flat bed truck. The story, along with a photo of the Tesla being put on the truck was bad publicity for Tesla, and Musk fired back as detailed in this San Jose Mercury News story. And, here’s the New York Times story “Stalled Out on Tesla’s Electric Highway” which started it all. Did the Tesla really run out of battery charge? The reporter says he could not even undo the emergency brake because there was not energy remaining in the vehicle. To me, this is the most important question that needs to be answered in evaluating the veracity of the article. I am not sure we will ever know that answer for certain. But there are some questions in this battle that we might be able to answer, and some of them are practical ones for EV drivers. Before we get to those, there’s some interesting analysis and reaction included here about the battle. Musk says the reporter never turned down the heat to save charge as recounted in the New York Times story, but turned it up. He also says that the reporter took a detour to reach one of the charging stations. The reporter retorts that he simply could not find that charging station in Milford, Connecticut. This Atlantic Wire story takes each claim point by point and analyzes it. Besides being barraged with a data dump, Broder was dumped on for saying that he thought he would get better mileage with the Tesla in stop and go traffic. As a practical matter, for EV drivers, this is one of the most important questions to come out of this mess. And, I would like to have it answered. My husband (let’s blame this one on him OK 🙂 ) often slows down his Nissan Leaf to save energy, and I am certain he has told me that it does get better mileage in stop and go traffic – running errands for example, than on the freeway in higher speeds. I thought this was covered in the user’s guide too, but I don’t have that handy at the moment. Certainly, slowing down is a recommendation – and becomes a necessity -as the battery charge lowers. What is the truth on this for a Nissan Leaf and a Tesla? Is mileage better in stop and go traffic than at high speeds on the freeway for EV’s? Finally, any reporter writing a review of a vehicles needs to be fully clear on when they charged the vehicle, and whether it was fully charged when they drove away from the charging station. That issue is one that Elon Musk raises with the New York Times. Musk says the Model S was charged 90 percent, 72 percent, 83 percent and only 28 percent during four charges which occurred during Broder’s drive. Maybe that is not what was agreed upon or advised for the story, but having little time to charge fully is a problem for real life EV drivers. Stop-and-go traffic gets me better range. My 30 mile commute on 85/280 takes about 55-60 mins/each way. Lots of stop-and-go. I usually got home with 17-20 miles left, that’s after 60 miles of driving and 2 hours waste of life a day. Last night, I had Doctor’s appt and drove total of 68 miles. Since the traffic was so bad, (Valentine’s Day thingy? ), I actually still got home with 20 miles left, that was 2 1/2 hours waste of life yesterday. Need my HOV sticker T_T.